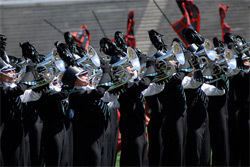 Following a unanimous vote of the Drum Corps International World Class member corps on Saturday, Jan. 24, the Cascades were approved to compete as a World Class corps on the 2009 Drum Corps International Tour. Founded in 1957 as the Greenwood Boys Club Corps, the Cascades won the Drum Corps International Division III World Championship title in 2000. In 2002, the corps became the first Pacific Northwest corps to become a Division I World Championship Finalist. The corps is currently headquartered in the Seattle suburb of Woodinville. According to Mike Bujnowsky, chairman of the board of the corps' parent organization, the Northwest Youth Music Association, the Cascades have faced numerous challenges in the recent past. "In 2006, the organization's bingo operation (used to fund corps operations) completely crashed right before the start of the corps' tour, and a number of board, staff and management disruptions occurred. 2007 was a year when it all started to come together again, and the corps had high hopes for 2008." Bujnowsky says the organization would have loved to continue its momentum from 2007, but insufficient recruitment of brass musicians made it difficult to put together a quality program. "Realizing the organization itself was strong, the board decided it was in everyone's best interest for the corps to take a year off in 2008 and put its energy into rebuilding. Management focused on the corps' true objectives and continued to bring together a full staff." Bujnowsky credits a recent merger with Open Class corps Spokane Thunder for helping solidify the brass section membership for a 2009 comeback. "The corps will have a full brass line for its target size of 112 members," he said. "That number was chosen in order to be prudent about the corps coming out after a year's hiatus and logistically to fit the entire corps on two buses." Bujnowsky says the organization is excited to keep the drum corps activity alive in the northwest and believes that the Cascades' re-emerging presence will also help to stimulate Open Class drum corps in the region. The Cascades will undergo an evaluation by DCI's Participation Review Committee at their February rehearsal camp as an additional check to ensure that all is going to plan. Pending a successful post-season operational review, the corps will be able to petition for full World Class membership.